If you are new to slow travel, or even an experienced slow traveler, you should consider Scotland as your next destination. In the last 2 years we have logged over 8,000 miles road tripping around the beautiful countryside enjoying the quaint little towns, friendly locals, and relaxed pace. In this post, we have picked our top two destinations, Dornoch in the Highlands and St. Andrews in the Lowlands and we go over all the characteristics that make each one a perfect slow travel town. Also, as a BIG BONUS–there is lots of great info and TIPS on road trips, things to do, and more. Where exactly is the Highlands and Lowlands? 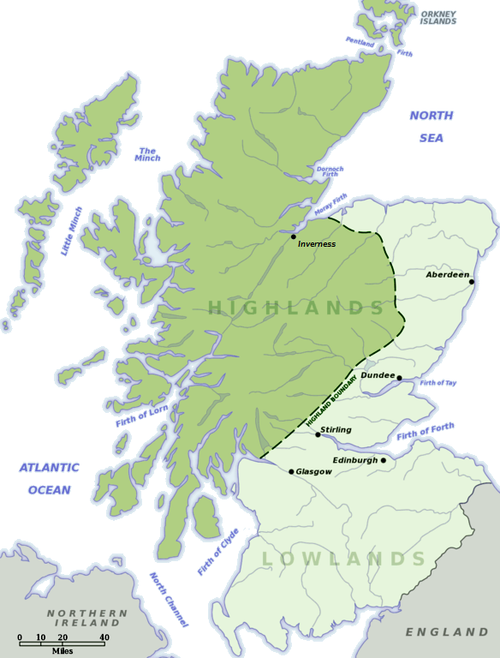 The Highlands and Lowlands are a culture divide that was developed in the Middle Ages. I used to think the country was just divided in half, the top and the bottom. Seems logical to me, right? Wrong. It’s actually a diagonal divide along a fault line, as you can see from the map below. Simply put, the Highlands is a less populated area of Scotland and considered the more historical part. Whereas, the Lowlands is more densely populated and a more industrialized area. I am sure it’s a little more complicated than that, but you get the picture. How Do We Pick A Town? If we had to choose our number one place to slow travel in the Highlands, Dornoch would be it. It’s a town with a great sense of community and it fits all our checked boxes with top ratings. Population: How Crowded Is It? Crowds, make a huge difference to us when we slow travel. It’s not a make or break situation, but it can surely ruin things and the reason why we choose the less populated towns. The last census in Dornoch revealed a population of about 1200 people– that checks our box for sure. Not to mention we just love quaint villages anyway, which means less crowds. Have I mentioned crowds before? Drivability: Can You Road Trip Easily? So when we say drivability, we mean how close it is to the major roads? Dornoch gets an A+ for drivability because it is about 5 minutes from the A9, the longest road in Scotland. The possibilities are endless for road trips, sightseeing, restaurants, shopping when you are this close to a major highway. So another big check. Sense of community: Are The Locals Friendly? This is an important one. Friendliness is a give and take relationship. You have to be pleasant to get pleasant. So yes, the locals are very lovely and very friendly. But, we take the time and effort to socialize and be a part of the community. Like I said, it’s a give and take thing. We shop, eat, and participate in the activities around town. Like the time we went to the local Celidah, and danced like nobody was watching. Unfortunately, everybody was watching…but lucky for me, one of the ladies took mercy on me, grabbed my hand and became my dance partner. I was whirling and twirling in no time. In the evenings, we like hanging out at the best whiskey hotel around, the Dornoch Castle Hotel, here you will find a wee dram, friendly staff and a warm peaty fire. If you’re lucky, there will be someone to strike up a conversation with….if not the bartenders don’t mind a wee chat either. For more ideas ..read this post ” 6 Things To Do In Dornoch, Scotland .” Also this website has a calendar of events. And for the whisky fans, every October there is the Dornoch Whisky Festival . We went last year and had a ball….although Mike and I could have a great time at a bus stop. It’s all what you make of it, right? Proximity to other areas: Is it a good home base? Proximity is a bit like drivability. It’s a place that is close to all the things you want to see. Dornoch is one of those places but you will need a car. We usually always rent a car anyway when we slow travel. *Note: The times are approximate since driving on the opposite side of the road makes me a nervous Nellie–which makes me yell at Mike to slow down. John O’Groat’s is supposed to be the most northern point of Scotland, it’s actually not, it’s Dunnet Head which isn’t far (if you want to visit). Regardless, you feel like you are at the top of the country anyway. You’ll be traveling North from Dornoch along part of the North Coast 500. Visit the town of Golspie, on the way. There is a beautiful scenic harbor there. Another great stop is the town of Wick. Once at John O’Groats, you can stroll the little village, have a bite to eat, take a picture with the sign, or take the ferry over to Orkney. It’s a great drive with lots of beautiful highland landscape. Just a heads up, we’ve been in summer and fall–both times it was pouring rain and cold, so be prepared. Travel west from Dornoch across the Highlands to the coastal town of Ullapool. The first part of the trip, you will be traveling along the scenic Dornoch Firth on the A836 to the A837 near the Kyle of Sutherland a river estuary. You will transition to the A85 through the Knockan Crag National Reserve until you reach the small port town of Ullapool. Once in Ullapool, if the weather is right–there’s a museum, shops, restaurants, galleries, and even ferry service to Stornoway. It’s a great place to spend the day. It was raining pretty hard on the day we went, so we just had lunch at a great bookshop/cafe called Ceilidh Place and walked around a bit. We will definitely go back in better weather to explore more. But the drive alone was worth it even if we couldn’t do much in Ullapool. Drive south from Dornoch on the A9 to the A82 towards Fort Augustus. Stop along the way at Drumnadrochit for breakfast or just to walk around. There’s a big souvenir shop, and a Loch Ness Centre. You’ll also pass through Inverness a large town of about 40,000 people. There’s lots to do in Inverness. The A82 runs right along side Loch Ness and some of the most beautiful scenery in Scotland. We suggest ending your drive in Fort Augustus where you can watch the boats pass through the 5 locks. If you want to walk around the small town, you will find restaurants, shops and boat trips on Loch Ness. Maybe you will even find Nessie! Suitable AirBnbs: Can you find a good one? We have slow traveled to Dornoch twice and both times stayed in the same Airbnb. Our Airbnb had everything we needed like a washer/dryer, well stocked kitchen, perfectly located, a normal size bed and very clean. When I did a quick search on Airbnb I found 64 listings for Dornoch, which gives you enough variety to find a suitable place. Location is not an issue because its a small town so any area you stay in Dornoch is fine. Local Markets: Can I buy my groceries close by? The answer is yes. There are 2 great markets in Dornoch. One is “The General Store” which focuses on local produce and unique foods a more ‘upscale’ type market. The other is the local “Co-operative Food “ Market. Here you will find everything you need to cook your meals in the airbnb. As vegans and slow travelers we usually cook our own food (if you peruse the blog, there are lots of posts on cooking and traveling). For a completely different experience in slow traveling, we like St. Andrews. Even though it’s at the top of the map, St. Andrews is considered the Lowlands. Remember, it’s a diagonal divide, not a top and bottom divide as one would assume. Either way they are still in different regions. Most people when they hear St. Andrews think of golf. Did you know there is also a castle, one of the oldest universities in the world, the beach, museums, a cathedral, restaurants, shops AND…drum roll please…THE coffee shop where Wills met Kate??!?!?! Yep, it’s true Ladies and Gents. Population: Is it just golfers and students? St. Andrews has a population of about 16,800 which by most standards is still pretty small for a city. In fact, it ranks #45 in population for Scotland, with Glasgow and Edinburgh being #1 and 2 respectively. When school is in session, University of St. Andrews students are 1/3 of the town’s population, so it can fluctuate by roughly 6,000 people depending on the time of year. The last time we were in St. Andrews —school was back and the big golf tournament was going on. We didn’t think the town was crowded at all. At least not compared to places like Paris, Rome, Moscow. So for us it was very manageble. So the answer is, no. There aren’t just students and golfers in St. Andrews we saw lots of tourists and met some locals too. We are going to have to give St. Andrews a good grade for drivability because of it’s location along the Fife Coast Route. It’s a beautiful 77 mile stretch on the eastern coast of Scotland. There are some stunning towns and lots to see all along this route. It’s just a gorgeous drive. So if you love to explore by car like we do, it is situated perfectly. But even if you aren’t into long drives, there are still plenty of easily accessible highways and byways to get you straight to the different tourist sites if that’s your thing. I won’t go over specific things to do in St. Andrews since I wrote a post on it here. Instead, I will just tell you why its fits our slow travel criteria for “Sense of Community”. First of all it is a university town, and we love university towns. They are always so vibrant and alive with hipsters and uni kids. While it is has a much different vibe than Dornoch, it still has a small town feel. And as a uni town, it has lots of great resources like markets, good restaurants, pubs, shops, services, etc., which come in handy if you need a SIM card, or a hair cut. The sense of community for us, lies in all the great places there are to congregate and socialize. Quiet and relaxing is nice, but vibrant and alive can be a welcome change too. One of our favorite places in St. Andrews, is the 4th floor bar of the Old Course Hotel. It has a huge glass window that overlooks the golf course and the gorgeous ocean. We would grab a drink, maybe an appetizer and just sit there forever staring out the window and listening to the interesting conversations of the golfers. It was like TV for us. Talk about slowwwww traveling—you couldn’t get any slower than that—which if you follow our instagram account SarjeantsOnFire you would know “Slow Travel O’clock” is our thing. There’s so many places to hang out in St. Andrews, you will never have to worry….. Proximity to Other Areas: A good home base? To get to Dunnotar Castle, head north on the A91 to the town of Dundee. Dundee is a great place to stop and check out the new V & A Museum (Victoria and Albert). Right next to that is the RSS Discovery Museum, which is an old Antarctic research ship that was built in 1901. After Dundee, get back on the A91 and continue north to the small coastal village of Arbroath–there you can check out the Abbey, have a pint, or snack on the famous Arbroath Smokie (smoked fish). Continue north on the A91 to the A92, stop in Johnshaven another small village that is very picturesque and has a public restroom. I don’t know about you, but those places always get bonus points for me on road trips! I suggest you pack breakfast or lunch before you head out on this day trip, because there’s a great spot to eat in Crail. To get there go south on the A917. Once there, find the coast and walk around–look for a steep plot of grass with benches. Have a seat, and in true slow travel style open up your snacks and just sit and enjoy the most gorgeous ocean view you have ever seen. For the rest of the day keep going south on the A917 and enjoy all the quaint coastal villages along the way. If you would rather not pack a lunch, Anstruther is a good place to eat. We saw an ice cream place, coffee shop, and again the most important stop….public restrooms. Our end point was Pittenweem–but we will leave that up to you. Everyone has a different tolerance for how long they want to stay out and how far they want to stray from ‘home’. We usually like to be back before dark because of the left sided driving issue and the many unlit roads. This day trip is all about visiting some great tourist sites. To get to the Secret Bunker, go south on A917 to B9131–it’s a fun place to visit and you can read about it here. After the Secret Bunker, you will still have time to head to Falkirk to see the Kelpies and the Wheel. Get on the A915 West to M90. We’ve been twice and the second time we decided to ride the Falkirk Wheel–we have a post on it here. Can you find Airbnb’s and Markets in St. Andrews? Absolutely, which is why it’s St. Andrews is our top choice for the lowland area. It’s a fairly large town not to mention the huge and expensive University located there, so they have to cater to all the students I am sure. Fun fact: The large majority of international students at University of St. Andrews are Americans. There are American kids everywhere–you just have to sit somewhere and……listen. You will HEAR them. Anyway, all the big chain supermarkets have stores in St. Andrews so if you are cooking for yourself then have no fear there are plenty of places to shop. As for airbnb’s, there’s at least 75-100 places to rent and if you want to splurge the Old Course Hotel. We actually spent one night there once and it was luxurious. It was so nice to sleep on a King Size bed for 1 night during our month trip. (King beds are hard to come by in Europe). Alright friends, you have finally come to the end of my very long winded post!! It was one of those things that I started and realized 1 month later-I was too far to turn back. Reminds of that time I was practically on my hands and knees inching my way along the treacherous path to Fingals Cave….oops SQUIRREL. Anyway, if you made it this far, I thank you. OH and I also applaud you too, because you my friend have a way longer attention span than I and you are my idol. I unfortunately or fortunately depending on how you look at it, have a very short one…..
P.S. Stay tuned because Mike is going to write a blog POST (he has a normal adult attention span so it should be soon)!!!!!!! Whether you’re new to slow traveling or a seasoned pro, Scotland is the perfect destination, to take it slow. This guide highlights two of the best towns to slow travel. Dornoch in the Highlands and St. Andrew’s in the Lowlands are ideal home bases for your next slow travel adventure. I really enjoyed reading your tips on slow travel in Scotland. We have been once to Scotland, briefly. But, all your positivity about slow travel in Scotland has us considering a House Sit in Scotland.